Cupertino, California; July 26, 2012: Graphic novel and comic book publisher Alternative Comics has moved to Cupertino, California after 19 years in Gainesville, Florida. The publisher has resumed operations under the new leadership of General Manager Marc Arsenault. Alternative Comics first new release in nearly four years will be Injury #4, co-published with series creator Ted May. Injury was previously published by Buenaventura Press. The book will be on wide release from October 10, 2012. The news of the move was broken by Publisher’s Weekly on Wednesday, July 25. Alternative Comics was founded by Jeff Mason in 1993. A leader in the field for 15 years, Alternative Comics published major works from respected creators Graham Annable, James Kochalka, Gabrielle Bell, Sam Henderson, Brandon Graham, Matt Madden, and many others in well over one hundred releases. Alternative Comics also published the print and online editions of the influential comics news magazine Indy. Jeff Mason ceased Alternative Comics’ operations in 2008 to focus on supporting his wife as she worked for her doctorate. He currently practices criminal law full time in Gainesville. The existing back-stock of in-print Alternative Comics titles has been moved to it’s new headquarters in Cupertino, California. Alternative Comics will be sharing office space with Arsenault’s long-running multiple media studio and mail order house Wow Cool. 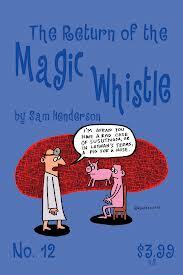 Alternative Comics has already announced the return of Sam Henderson’s long running series Magic Whistle. Issue 12 will debut at the Brooklyn Comics and Graphics Festival in November. Upcoming releases also include new books by Boston Phoenix artist Karl Stevens, Steven Cerio, and James Kochalka. Full details of Spring 2013 releases are to be announced in August. Alternative Comics is an independent graphic novel and comic book publisher based in Cupertino, California since April, 2012. The company was founded in 1993 by Jeff Mason in Gainesville, Florida in 1993. During the first 15 years of operation Alternative Comics’ cartoonists and publications were nominated for and won multiple comics-industry awards. 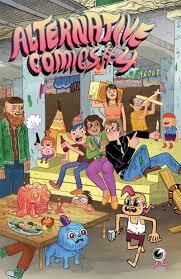 Alternative Comics’ publications are distributed by Diamond Comics and Last Gasp. Marc Arsenault has worked in the comic book industry in a variety of roles since the late 1980s. He served as Assistant Art Director and an editor for Kevin Eastman’s Tundra publishing and as the Art Director for Fantagraphics Books. Marc edited and art directed the Eisner Award nominated books The Michael Kaluta Sketchbook (Kitchen Sink Press, 1993) and Malicious Resplendence: The Painting of Robert Williams (Fantagraphics Books, 1997). Marc also had a long association with influential Berkeley, California retailer Comic Relief. Marc’s company Wow Cool relaunched business as a comic book and music retailer and distributor in October, 2011.